Today we said goodbye to our wonderful 2nd year missionaries. They've been our mentors, our friends, our examples these last six months and we can hardly stand that the end of their mission has arrived, and ours is soon to follow. We hosted a farewell dinner celebration for them last night. And early this morning they began their departure. A group of us gathered at the entrance of our Ranch 66 Missionary Village campground to bid them farewell, one more time. They stopped, and hugs and tears were exchanged one last time, with hopes that we would be able to see each other again one day, but with realization that many we would probably never see again on this earth. It was an emotional farewell. And then a mile or so beyond, they met at the gate that led to the highway, all these dear friends who had served together for two years. They exchanged hugs one last time, took one more photo, then gathered for a group prayer before they departed for their various destinations. Our director, Elder Fenn, bid each one goodbye at the gate, and then they were gone. We weren't there to witness this last exchange, but just seeing the photos one of our friends who followed them to the highway has shared brings renewed emotion. What a very special blessing to have these amazing missionaries as our companions as we've served here at Martin's Cove this summer. We have never-to-be-forgotten memories of our experiences with them. We recently had the privilege of re-enacting the experience of Jens and Elsie Nielson on Rocky Ridge. We studied to learn all we could of their lives and knew they were strong and stalwart members, sacrificing the money saved from the sale of their farm in Denmark to share with others who did not have the means to travel to Zion, but with their help could now go by handcart. Their plans to purchase a wagon were abandoned as they would also travel by handcart. After the first winter storms hit the Willie and Martin handcart companies crossing present day Wyoming in mid-October 1856, we knew Jens had done all in his power to push and pull his handcart for weeks through deep snow until finally his feet were so frozen he could go no further. We knew they along with all their company were starving, but we also knew Elsie was willing to do whatever was necessary to save the life of her sweetheart. Although less than five feet tall, she truly did save his life as she pulled him in their handcart for about a week until a wagon was available for him to ride in. We didn’t really have a concept of how difficult this was for Jens and Elsie. We learned, in some small way, that day on Rocky Ridge. As we pulled the handcart together, Jens eventually collapsed and I helped him into the handcart. I tried to imagine Elsie doing this, placing blankets or clothing under and around him to help protect him from the jarring and discomfort in this box of rescue. We learned immediately how challenging this must have been to fit a grown man in such a small space without great discomfort for Jens. As I began to pull the handcart alone, a steep incline was immediately in my face. No matter which way I turned the cart I could not get the wheels over this incline. What later, as we descended, looked like a tiny hill seemed now so out my ability to ascend. I knew Elsie had obstacles like this to get through and I was determined I could and would do the same. I tried to find something on the trail I could grab hold of to help me get better leverage; some rock in the dirt or brush close by. I put the bar of the handcart across my stomach and reached ahead on the trail into the dirt for anything I could grab that would help me pull a few inches up over the hill. There was nothing but sand and dirt and loose rocks at that point. I pictured Elsie pulling up this hill in the snow and wondered if she could have gotten a grip on snow that would help her. I wondered how she could have pulled the wheels through deep snow and ice in a driving blizzard. It very soon became apparent to me I could not do this alone. I wondered if Jens had been able to help Elsie at such times and as Jens/Elder Brunner pushed with all his might on the spokes of the wheel from his cramped and awkward position in the bed of the cart, we were finally able to get over that first little hill. By now I was panting for breath and exhausted, but determined to do this on my own as Elsie must have done. "Angels" had been designated to come to our aid when we signaled them, and they were close at hand, asking repeatedly if they could help me. I kept answering “no, not yet, I can do this”. I don’t know how long I tried to do it alone, nor how far I made it without our angel helpers. I prayed for help almost from the first moments I began to pull. I kept pleading “Heavenly Father, please help me, please help me do this”. Then as our angels would call out that they were there, I would answer over and over, “no, not yet, I can do this”. Part of me wanted to do this for Elsie, as she would have done it; part as I wanted to do it. I'd had an opportunity to be involved in two "women's pulls" at Martin's Cove and Willie Sixth Crossing where the men drop out and women pull the handcart alone, simulating what it would have been like when the husbands and fathers died or were disabled and the women had to pull their carts alone. I had been somewhat disappointed at the conclusion of the woman’s pull. It hadn’t been challenging enough. I wanted to know what it really was like for the women to pull their handcarts alone and I felt it must have been much harder than the experience of an empty cart with 5 to 8 women pulling and pushing. Now I was getting a full dose of realization, and I simply could not do it alone up the steep Rocky Ridge ascent. I knew at some point our angels (Sister Simper and Sister Haacke) had begun pushing the handcart. I could feel, as we hear in the pioneer journals, that the handcart began pushing me. I didn’t look back, but I knew they were there. I had been told that when I had done all I could I was to give the angels a signal to begin helping. I never gave them that signal, but the angels knew when enough was enough and they made the decision themselves that they would help us. Even with their help the ascent up Rocky Ridge was very difficult. I’d asked our Elder angels (Elder Haacke and Elder Simper) to let the women try to do it alone as long as we could. They honored this request and just as they knew more help was needed, Sister Sanders came running down the ridge to help pull the cart over. I didn’t hear her, but was told that she asked the men to let the women do it alone for now. Finally, there was no way to make it without the help of our men angels as well. There were now six of us on the handcart, and still this was not enough. Other men and women joined in and helped over the last rocks and steep incline of Rocky Ridge. · I know that Elsie and Jens could not have endured this challenge without heavenly help. It is too hard, too physically taxing, too emotionally draining to know the life of a loved one is in your hands and you cannot do what needs to be done to save their life. Elsie could not have done what she did without help. · None of the handcart pioneers could have done what they did without heavenly help. When they had given all they had and there was no more to draw upon, I know angels were there to help them. · I believe that heavenly help was there sooner than later. They had been starving for weeks. They were freezing and pulling in below zero temperatures with gale force winds. It is too physically impossible to have done what they did without that help. · When I was pleading for Heavenly Father to help me, He was. He had sent angels to help. I was telling them no, not yet. I wonder how often I do this in my personal life now, turning aside heavenly help that is ready and willing, because of my own pride or determination to do it alone. And I know heavenly help is often sent to our aide in the form of Heavenly Father's other children. How many times does help come to us from earthly angels in answer to our prayers? · I am convinced we each have angels to help us. They know us and love us and have part in the everyday accomplishments of life and are there assisting us, even at times when we have not asked for that help. · When I look at photos now and see all the hands that were there helping to pull that one handcart up Rocky Ridge, I know beyond a shadow of doubt that there was much help for all of our handcart pioneers to accomplish what they did, as well as with the amazing rescuers who accomplished the seemingly impossible to bring them to safety. · Sacrificing for those we love draws us closer to them. And being on the receiving end of that sacrifice by others is perhaps even more powerful. · I am overwhelmed by the faith and determination of our handcart pioneers. They had, as Wallace Stegner stated “none of the skills that make frontiersmen. But they had some of the stuff that makes heroes”. They are my heroes in a very real and personal way. · This was a life-changing experience for us. 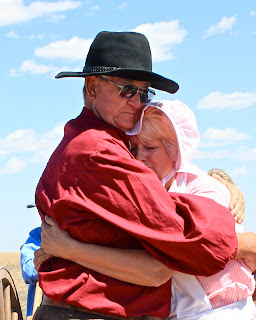 We know we will never look at our handcart pioneers in the same way, and we will never doubt heavens help that was there for them and is there for us. From Jens’ perspective, I had a real struggle watching my wife working so hard with so little result. I was concerned about how I could help. I decided to push on the spoke at the top near the wheel, and help turn the wheel a little. My wife felt this help, and asked me to time it with her pull. She would count to three, and we would both give it all we had. After a few tries, the handcart jumped over the small bump, and working together we were able to make some progress. It was so hard for me to remain in the handcart and watch my sweet wife struggle so much. I wanted so much to get out and help her instead of being a burden. When members of the Riverton Wyoming Stake built a new monument in Martin’s Cove in 1992, Church members’ interest in visiting the area increased substantially. Although the cove was on public land, access was greatly restricted for a few years because visitors had to cross the private property of the Sun Ranch to reach it. Sun family members entered into negotiations for a number of years with the Church and terms for sale of a portion of the ranch were finalized in July 1996. President Gordon B. Hinckley promised that the ranch would be forever known as the Sun Ranch and that the Sun name would be honored and remembered under the stewardship of the Church. After purchasing the ranch, the Church renovated the ranch house and made it into a visitors center. One of the rooms of the visitors center is dedicated to the Sun family. It was maintained by the family as something of a family museum while living in the old ranch house. The artifacts, documents, and photographs in this room chronicle the Sun family’s life and work for four generations on their historic ranch. The Sun family protected the sacred ground in the cove for decades. Their generosity and cooperation played a key part in helping honor and remember the Willie and Martin handcart pioneers of 1856. The bunkhouse, washhouse, blacksmith shop and barn are all original to the ranch and have been restored and preserved to tell the story of 1880’s ranch life here on the high plains of Wyoming. When President Hinckley dedicated the Visitors Center on May 3, 1997 he spoke with members of the Sun family. Under an agreement with the family, the Church has purchased about a third of the 12,000-acre deeded land. This includes access to Martin's Cove, which is on Bureau of Land Management land, and most of the Sweetwater Valley owned by the Sun family. "Please know of our very, very deep appreciation to the Sun family," President Hinckley told members of the family, which have owned the ranch for four generations. Tom de Beau Soliel (Sun) was the original owner. He arrived in the Sweetwater Valley in 1860, only four years after the handcart pioneers passed through the area. "We make a pledge to you that we will take care of the property. This historic building will become the visitors center which will be visited by many thousands of people." "I make a plea, go in a spirit of reverence and respect, and know that you are walking on hallowed ground made sacred by the sacrifices of those who have gone before us…We hope that a spirit of peace and reverence and sacred remembrance will hover over this whole area as a beneficent cloud on a hot summer day, and that those who here perished will not have died in vain." With this amazing background, the mission began preparations in August to have the first ever “Sun Ranch Day” commemorating and celebrating 140 years since the founding and establishment of the Sun Ranch. Having lots of experience in dutch oven cooking for groups, we were given the charge to prepare a dutch oven meal for the up to 1,000 people estimated to attend. The menu we were requested to prepare was stew, fry bread and cobbler. The word of Sun Ranch Day spread throughout the neighboring communities like wild-fire. Somehow radio spots and newspaper announcements began appearing. Not wanting to run short on food, we increased our preparations to provide food for 1,200. Ours wasn’t the only activity associated with Sun Ranch Day. Our event began at 10:00 am and concluded at 7:00 pm. There were crafts at the Fort for children (mountain man necklace, yarn snakes, whirligigs and prarie dolls), games at the Trek Center (stick pull, hoop and stick race, wagon wheel and hoop catch), ham radio broadcasts from the Fort, handcart treks, pioneer stories every half hour, pioneer story videos, Pony Express Re-enactment and exchange, and entertainment every hour. This all culminated with a chuckwagon dinner beginning at 5 pm with seatings every 30 minutes, and more wonderful entertainment. The preparations took weeks as we researched the best places to purchase food and ingredients for this mammoth task. We contacted neighboring stakes to see how many dutch ovens were available from members and soon realized that preparing such a large amount of food would take many more and many larger dutch ovens than were available locally. Ron began contacting friends and total strangers in the Salt Lake City area, requesting use of their giant ovens for this event. Through the kindness and generosity of these individuals, and huge efforts of our son Donovan and missionary friends here who were traveling to Salt Lake City and Evanston with their pickup trucks, all this equipment was miraculously acquired for our use and transported here. A work crew of over 40 assisted throughout the week with preparations and then the day and evening of Sun Ranch Day. All these efforts resulted in massive amounts of delicious food, prepared and served in dutch ovens to a hungry crowd numbering approximately 700. We had surplus food for meals for the missionaries and another large event soon after this one was completed. We felt blessed to have the strength to do all that was needed and to have an amazing support crew of senior missionaries and members of the Casper Stake working together to provide a wonderfully successful event. Just as President Hinckley promised, the Sun family name continues to be respected and honored here at this sacred place. A terrible and wonderful event was associated with our recent Sun Ranch Day celebration. At the conclusion of the evening, as the last cooking of the fry bread was taking place, one of our senior missionaries, Sister Lindley, was assisting. Oil had accidentally been spilled on the floor during the cooking process and she slipped and fell onto the grill, her entire arm and hand being immersed in the hot oil. Immediate medical assistance was provided by several nurses who are serving here. A young physician visiting the event heard of the accident and also came to give support and direction. Her hand and arm were immersed in ice water and determination of the extent of the burns was made. Her hand and arm were already blistering. I felt sure an immediate and urgent transport to the nearest hospital would be taking place any moment. As help was administered to prevent her from going further into shock, a more important help was offered. Her sweet husband administered to her and pronounced a powerful priesthood blessing upon her. She became more stable and the blistering on her hand and arm went away. The doctor gave instruction of what to do and not do and they were able to leave to go home to their trailer, rather than to the hospital. The missionaries gathered together that evening before leaving for our trailers and Elder Fenn offered a powerful and pleading prayer in Sister Lindley's behalf. I don't know that I've ever heard such a prayer. It was humble, sincere, and mighty in beseeching the Lord to protect and heal her as she and we had done all in our power to serve Him and do all we could in providing this event to honor and remember the Sun family and keep a prophet's word that the Sun family name would only be spoken with respect and love from the Church. The next day was Sunday and the miracle continued. Sister Lindley came to church. She had been able to sleep through the night and her pain was minimal. Over the next few days her recovery continued. Now, a week later, she is doing well, still bandaged, but with little pain and healing is taking place. "As I've been serving here at Martin's Cove I've prayed that I would feel what the Saints here felt and understand what they went through. I woke up Saturday night after my accident at 1am and I could feel what Elizabeth Horrocks Jackson felt as her husband had died and she was left with three young children alone and far from her home - how desperate, sad, and lonely she was. I felt what others felt as their limbs were frozen and how desperate they were for help. I felt the comfort of knowing the Savior then, and that He was with them as well. I felt peace come over me and I was able to sleep the rest of the night. It is an honor and privilege to serve here and I know the Savior lives. He is as real to me as each of you are. I have felt His love and know He wants us to do what we're doing here." I had the privilege of praying through that night for Sister Lindley. I felt somewhat responsible for the accident as I was so intent on getting the food prepared and out to the service lines that I really wasn't paying attention to the cooking conditions. It had never occurred to me to check the floor for oil. I recognized that had I paid better attention this accident might have been avoided. As I tossed and turned throughout the night I must have asked Heavenly Father 15-20 times that she be protected, healed, and kept from suffering because of my negligence. I thanked Him that she had been able to go home and prayed for a miracle to heal her wounds. I cannot tell you the shock and relief I felt in seeing her at church. I couldn't keep the tears from my eyes. I believed my prayers could be answered, but just seeing her there after what had happened just hours before was more than I expected. I learned the next day that her blouse was ruined as it had a burned section across her back and side where she had fallen against the hot griddle. She has no burns anywhere on her body except her arm and hand. What a wonderful tender mercy of the Lord has been her healing and recuperation. Although Sister Lindley still has healing to take place, and her skin has started to peel off her arm and hand, she is a living testimony of the power of the priesthood and the power of prayer. We learned months ago of a similar experience of one of the Martin handcart pioneers, thirteen year old Mary Barton. As she was traveling in from England 1856 on the ship Horizon she had boiling hot soup accidentally poured down her back. She testified of her experience of having a priesthood blessing and how the pain left her and she was healed without problems. I know we witnessed a similar miracle in the protection and care of Sister Lindley as she served the Lord here at Mormon Handcart Historic Sites. As we serve at Mormon Handcart Historic Sites we're daily involved in a myriad of projects and assignments. One day we may be in charge of cleaning restrooms at the Homestead and on the trails, another day we'll serve in the Visitors Center, another day at one of the posts on the trail telling trekkers and visitors of the experiences of our handcart pioneers. Every day is different and every assignment finds us with different responsibilities. We've learned very quickly the outstanding talents and skills of our wonderful missionary friends. They're amazing and make serving at MHHS a joy. Here are just a few of the people we serve with and places we're at. Good food is an important part of missionary service! Sister Graham is another delightful neighbor. Baby bunnies abound here now. Here one is on the little patch of grass by the Grahams "Box"
Elders Brunner & Iverson cooking for a missionary gathering. The wind always seems to blow in WY, so they moved equipment out of this shed so they could grill effectively. to learn their responsibility for the day. careless drivers had disposed of out the window. Francom, Pratt and Shepard hard at work. Several sisters worked on quilts all day. We were able to complete 10 that day! when they've completed their assignments early. Elder & Sister Bagby & Sister Ward hard at work. Elder Brunner & Sister Ward finishing up the quilt. and Travers work on projects when visitors are not there. Sisters Fowler & Starr are the amazing schedulers here. and are always happy, upbeat and accomdating. Elder Minnick (another Loop B neighbor) serving at the Blacksmith Shop. protected from the weather and the messy paint! While Elders Simper, Haacke, Crabtree & Holman dig fence post holes. Sisters Smith & Hardy keep the office running smooth! fixin's for Pioneer Day celebration! more about handcart pioneer history and ranch life in the late 1800's. Sisters Ohm, Haacke, Onstine & Varty waiting for the children to arrive. Sister Fenn busily doing good! Sister Onstine is in the process of making a fleece stuffed bunny. Sisters Lindley & Spaulding work hard on yard crew every week. Graham & Travers with Sister Shepard knitting a hat.